Describing themselves ‘pro-Quaddaffi’ militants as reported by the Times of Malta, two Libyans with hand grenades hijacked an Afriqiyah Airways Airbus A320 with 118 passengers on board and diverted it to Malta. 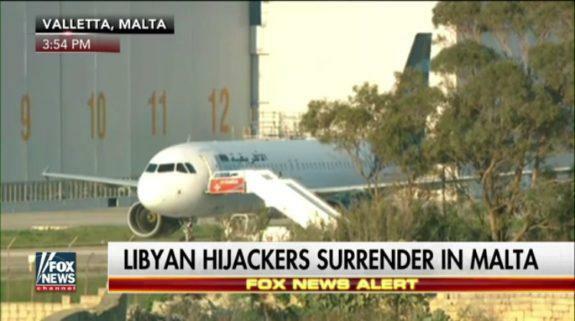 The flight was from Sabha to Tripoli. The militants had threatened to blow up the plane before surrendering with officials later acknowledging that none of the passengers had been harmed. It is just another evidence of the quagmire the West, egged on by a fearful France, enraged by Quaddaffi’s attempt to create an African IMF that would have unloaded a broadside against the French colonial empire in Africa by destroying the CFA franc, placed Libya in when they destroyed one of the most well managed countries and economies in Africa with their intervention.